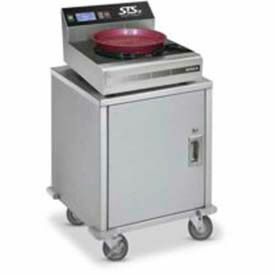 Induction Chargers Are Used For Use In Commercial Kitchens. Induction Chargers are constructed with stainless steel, high heat plastic and other high quality materials for long lasting durability and dependability. Patented induction base with built-in chip relays information to heating unit protecting base from over-heating or excessive cycling. Tables include second storage shelf to hold extra bases or other serving accessories. Available as stationary table or with locking caster. We Do Not Accept Returns On Any Dinex Equipment Or Dinex Custom Products. Please Contact Your Local Dinex Rep To Ensure Order Accuracy Prior To Ordering. Types are Induction Charger, Cabinet/Stand and Table For Induction Charger. Color finishes are Stainless Steel and White/Black. Dimensions vary per type. Case quantity is 1.